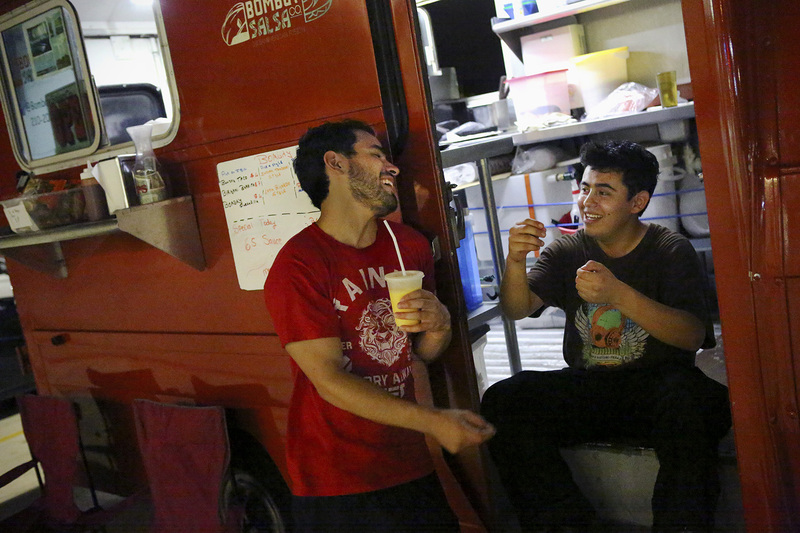 Nicolas Huang, left, laughs with Bombay Salsa Company food truck worker Daniel E. Rodriguez on Saturday, June 28, 2014, in the parking lot of the CVS Pharmacy on Chase Hill Boulevard near the University of Texas at San Antonio campus. Huang, a UTSA student, said he often goes to the food truck, which is open Thursday through Saturday nights at the pharmacy’s parking lot. The truck serves Indian/Latin American fusion food and began operating two years ago after proprietor Hitish Nathani began experimenting with combining the two cuisines.